As good as we were last week when it came to eating home, we were as bad this week. I had to work Wednesday and Thursday so I was in Lansing. I got home really late Thursday night and when J got home from work at noon, I was still in bed. She got me up and talked me in to going out for lunch. For a couple weeks now, I’ve been pitching a place in Texas Corners that I thought looked good. Once again, we picked a place based on their website and menu. No word of mouth or even reviews. I just thought the place sounded good. 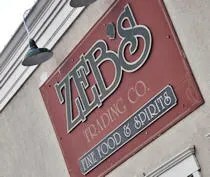 Zeb’s Trading Company is in the part of Texas Township known as Texas Corners. It’s right on the corner at 8th Street and Q Avenue. Since I didn’t get up until noon, we went for a little bit later lunch, but the parking lot was still packed. There are two entrances to the building, but they are both on the same side. One leads you right into the bar. The other brings you in between the bar and the dining room. A hostess met us and showed us to a booth along the back wall. The space isn’t really all that big, but they pack the tables in. The hostess started going one way, but we had to double back because there was no room for us to squeeze through two tables to the booth we were going to. Zeb’s was hoping this Friday afternoon. Almost all the tables in the dining room were full as were many in the bar. The decor is sort of old west. The interior walls are faux log cabin and many of the decorations are of an old west/Tex-Mex nature. J and I both ordered Pepsi’s to start. 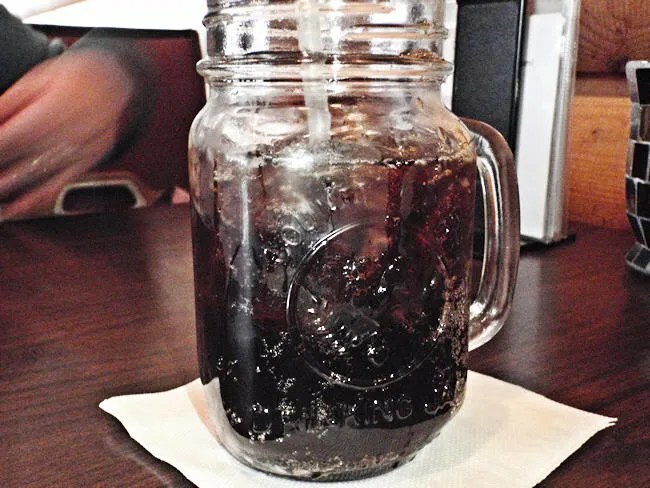 We both had a little chuckle when the waitress set down two mason jars with our pop. It was awesome. They weren’t actual Mason jars. They were another brand…in fact, we have the same glass in our cabinet that J’s grandma got from a restaurant in Florida, so it must be a company that makes the glasses for restaurants. We saw many signs, flyers, etc. bragging about their BBQ. One of the specials was a pulled pork sandwich. I was hesitant because it didn’t say it was smoked, but J bit. She got the the pulled pork sandwich with fries which was the special. 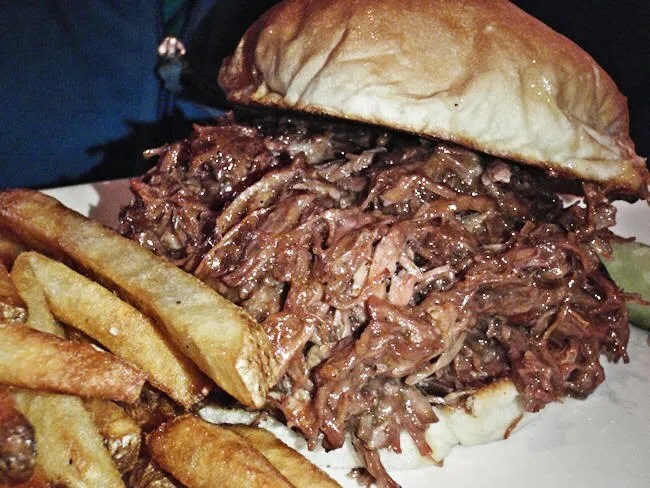 The sandwich was piled high with a pulled pork that had been roasted, not smoked. It was still tender and juicy, but it was covered in BBQ sauce. We both kind of prefer out pork naked to start. The sauce was good, but it was pretty mild. Again, we prefer sauces that have strong flavors whether it’s sweet or vinegary doesn’t matter. We just like the bold sauce. The fries that came with the sandwich were a perfect golden brown, but the sandwich was too much for J. She had quite a few fries left when we asked the waitress to take the plates away. I ordered BBQ Bacon Cheddar Burger. 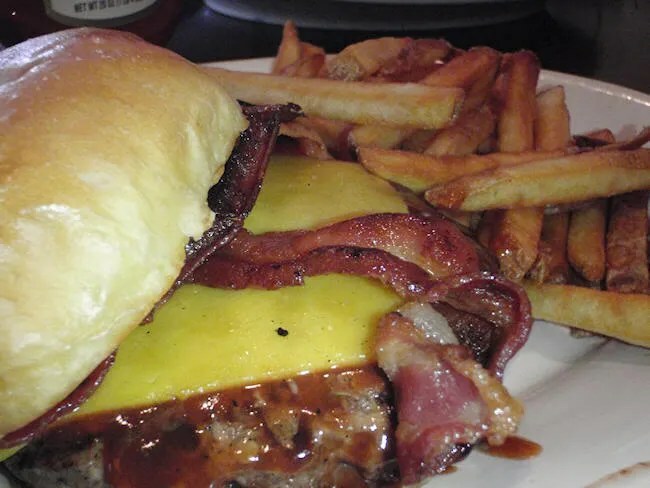 The sandwich is a 1/2lb Steakburger topped with cheddar cheese, bacon, and the same BBQ sauce that J got on her sandwich. The first thing I noticed is that there was a lot of BBQ sauce. It was one of those times that once I picked the sandwich up, I didn’t want to set it down. If I did, sauce that had dripped off on to the plate would make the bottom bun all soggy. It’s not a bad problem to have. You can never have to much BBQ sauce. The burger was good and it was really filling. I’m not a huge fan of steakburgers because there’s not as much fat, so they’re not as juicy. That wasn’t really a problem with this one because there was so much sauce, the taste of the meat was kind of an second thought. Like J, I had a few fries left on my plate, but it wasn’t because I didn’t want to eat them. The fries were delicious. I was using some of the sauce that dripped off my sandwich to dip them in. Our bill was right around $20. For a place that advertises as “Fine Food” that’s a pretty good price for lunch. Neither one of us left hungry and it was well into the evening before we even started thinking about eating again. 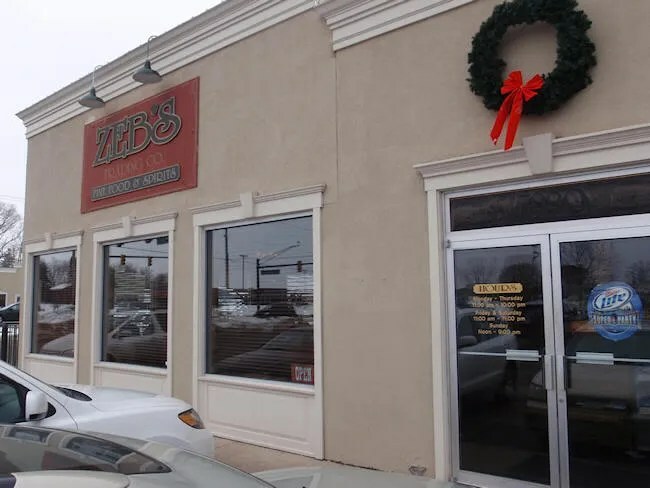 There’s a lot more of Zeb’s menu that I would like to try. What we had on this trip was good and worth the drive out to Texas Corners.